Heat oven to 350°F. In small microwavable bowl, microwave 1/4 cup of the butter uncovered on High 30 to 50 seconds or until melted. 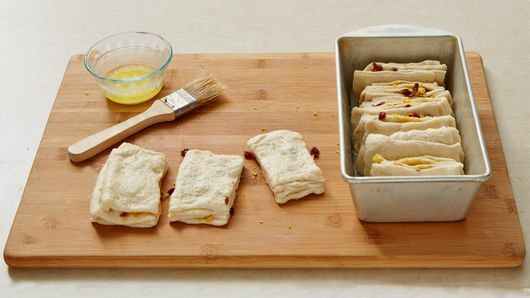 Line bottom of 9x5-inch loaf pan with Reynolds® Parchment Paper. Lightly brush bottom and sides with small amount of the melted butter. In small bowl, mix granulated sugar, cherries and orange peel; set aside. Unroll 1 can of dough on work surface; press to form 16x12-inch rectangle. 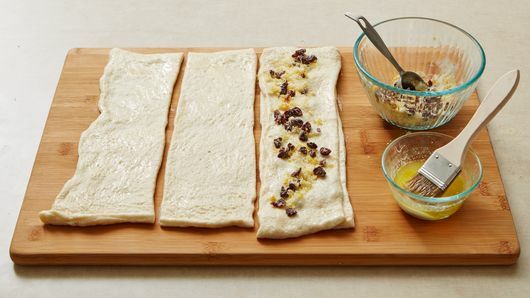 With pizza cutter or sharp knife, cut crosswise into 4 rows to make 4 (12x4-inch) rectangles. Brush rectangles with some of the remaining melted butter. Working quickly, sprinkle 1 rectangle with 1 rounded tablespoon sugar mixture. Top with another dough rectangle, butter side down. Brush top of rectangle with some of the butter, and sprinkle with 1 rounded tablespoon sugar mixture. Repeat with remaining 2 rectangles. 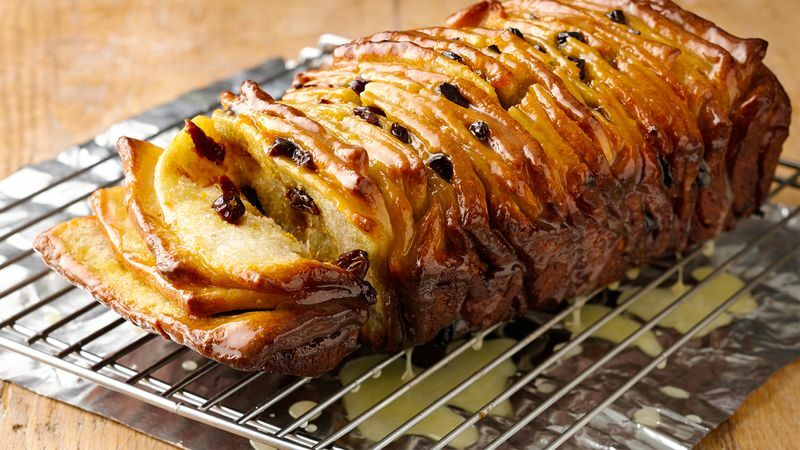 Bake 45 to 55 minutes or until deep golden brown, covering with Reynolds Wrap® Aluminum Foil, if necessary, to prevent excess browning. Cool 15 minutes in pan on cooling rack. Run knife around sides of pan to loosen bread. 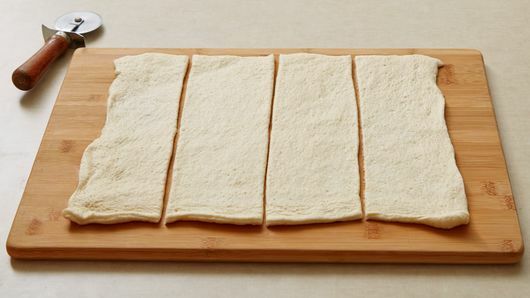 Remove from pan to cooling rack set over a sheet of parchment paper or foil. Meanwhile, in medium microwavable bowl, microwave remaining 1/4 cup butter uncovered on High 30 to 50 seconds or until melted. Add the powdered sugar and almond extract; mix until smooth. Brush icing over breakfast bread. Serve warm.